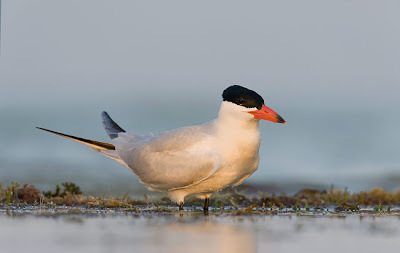 Caspian tern by Arthur Morris/Birds As Art. Yesterday about 15 of us were sitting around a set of tables in the Hotel Lakeside, discussing details for the upcoming Midwest Birding Symposium, when a Caspian tern flew past the windows along the Lake Eire shore. Of course I couldn't help myself. I grabbed my friend Judy's binoculars and checked out this big, beautiful tern. And I shouted out the ID of the bird, completely stopping the meeting in its tracks. The bird watchers in the meeting with me swiveled in their chairs for a look. The non-birders sort of sat there smiling in a mixture of amazement and amusement. No matter, I took this sighting as a good omen. The Caspian tern is the bird we chose for the event's logo, designed by Claire Mullen, production director at Bird Watcher's Digest. The fact that this "awesome beast" (if I may quote Jim McCormac) chose to fly past to say hello bodes well for this birding event, which will be held at Lakeside, Ohio from September 17 to 20, 2009. I hope you'll consider joining us at the MBS. We've got fabulous speakers, awesome birds, a sold-out Birder's Marketplace full of everything for birders, and a weekend full of mucho, mucho fun. Details are available here. Among our speakers is the man who took the Caspian tern photo above, Arthur Morris. Artie will be speaking and leading a workshop on digital bird photography. 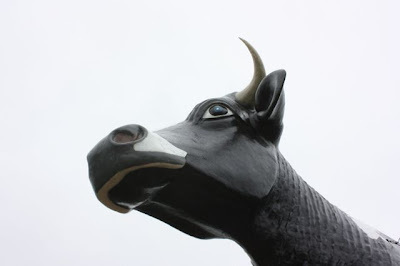 The massive bovine form of New Salem Sue can be seen from a long distance away. 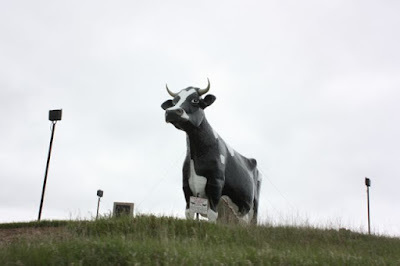 She's called Salem Sue and she lives in—towers over, really—the town of New Salem, North Dakota on the south side of I-94, west of Bismarck. We saw a sign for her shortly before we saw her looming presence, standing tall on top of a hill. 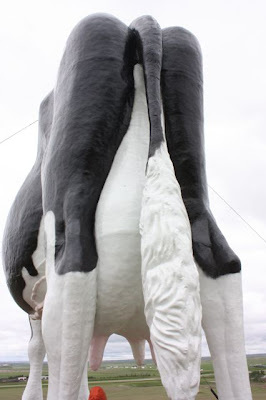 She is the world's largest Holstein cow statue. 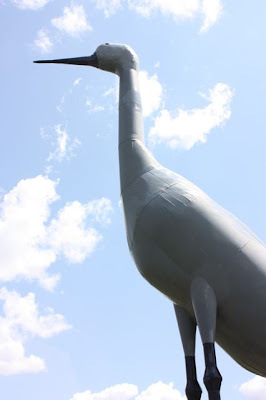 There was no way we were simply going to drive past her without stopping for a hi-dee-ho and a closer gander. 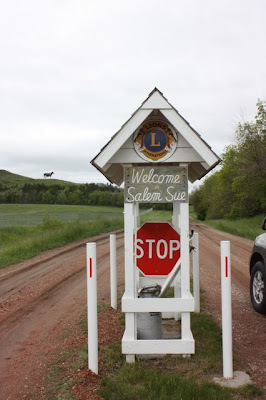 Sue's is cared for by the local Lions Club. She did not disappoint. We stopped at the small entrance kiosk and happily donated our $3 per car full. Then we fish-tailed our way up the muddy road to Sue. 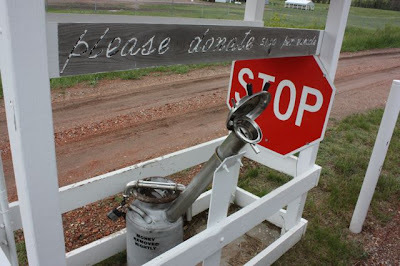 The donation receptacle was a modified milk can. Three things struck us as we stepped out of our vehicle. One, it was cold—probably about 45 degrees, not bad for a June afternoon. Two, the wind hit us like a freight train. We needed to hold onto each other to keep from being blown off Sue's hill. Wind chill estimate: -73 degrees F. I could feel my skin turning blue, under my three coats. My exposed skin had lost all sensation. She's a proud one, that Sue. Liam was full of curiosity and questions. Three: Sue was not only huge, she was anatomically correct. And she was in desperate need of a robust milking. 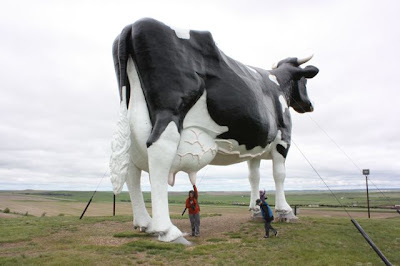 It occurred to me that, had Sue's udders been leaking milk, the entire southeastern quarter of Morton County would have been covered in frothy dairy goodness. 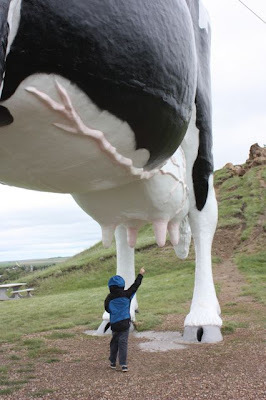 That is one big Holstein. The wind was so strong, it was hard to stand up straight. We stood there, shivering in our amazement. Took some photos. 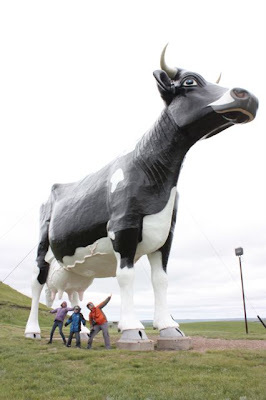 Then each of us tracked a pound of mud into our Toyota Sasquatch (or whatever it was we were driving) and we headed west, toward the Montana border, our giant holstein jones having been satisfied. 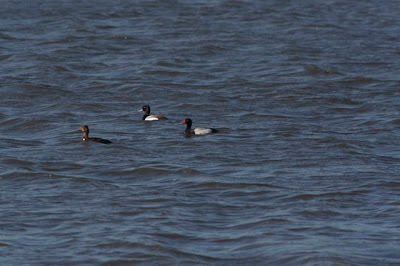 We finally re-found the weird-looking scaup on an adjoining part of the lake where we'd originally spotted it. And this time the light was a bit better, so we took good long looks in between getting more still and video images. Blowing up one of the digiscoped stills on my camera screen, I noticed something odd. The scaup was preening and this gave me a unique angle on the bill and the bight orange-red color patch. "Hey! That's some sort of colored tag attached to the bird's bill! It's NOT a natural part of the duck." This view showed a clear gap between the bill and the colored patch, leading us to suspect this was something artificial. 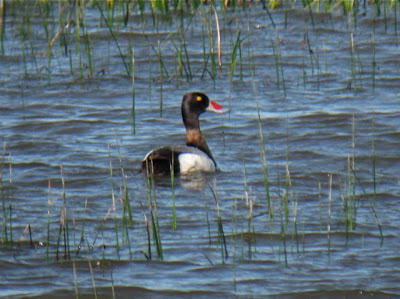 From a normal angle, with the scaup swimming in profile, the colored patch looked more like a part of the bill. But there were still things that bothered us about this bird. It looked and acted differently than its fellow male lesser scaup nearby. This made us wonder if the bill marker/tag was affecting the bird in some way. Was it affecting his social status among the other scaup? I've seen albino birds attacked and driven off by members of their own species. Was it physically painful or did it affect the bird in some physical way? He certainly looked duller and less round-headed and acted shyer than his peers most of the time we watched him. Here's a video I shot through my scope that shows the marked scaup's behavior while apparently trying to defend a female (his mate?) from other potential suitors. NOTE: You might want to turn down your speaker volume: the wind noise on this video is loud. 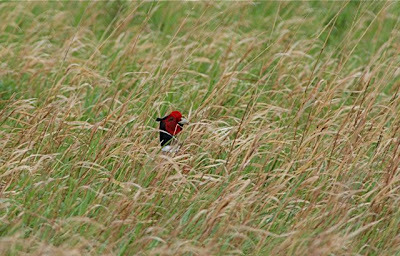 That evening at the social hour, I cornered Ron Martin, one of North Dakota's top birders, to ask about the bird. "Oh yeah, we've seen a few scaup like that over the years. There's some guy doing research on them. You can probably find him on the Internet." Well, Ron was right. Searching "ducks with bill tags" I got a posting from MOU-net. It gave a number for the Minnesota DNR where, back in 2005, birders and hunters were encouraged to report sightings of tagged birds. The kind souls at MN DNR were no longer collecting the sightings, but they pointed me to a professor at Louisiana State University who, apparently, had lead the research projects that were tagging scaup. I sent off an e-mail asking if he wanted my report but have heard nothing yet. 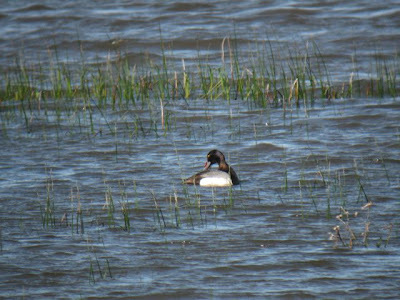 Scaup are experiencing a fairly rapid decline in population and waterfowl researchers are trying to discover why. Lesser scaup migrating up the Mississippi River were being bill tagged back in 2004 and 2005. If I hear anything from the researchers, I'll let you all know. I was disappointed that this was not some weird vagrant duck, though I knew the chances of that were slimmer than a male pintail's tail. I was, however, glad to have solved the mystery. I feel a bit of pity for the poor duck, which has had to live with that crazy thing attached to its bill. If nothing else, I hope the researchers eventually discover what's behind the scaup population decline. 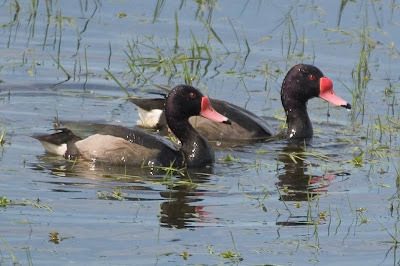 Rosy-billed pochards from South America. 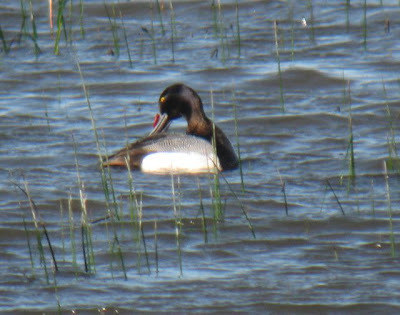 Artificially-rosy-billed lesser scaup from North Dakota. 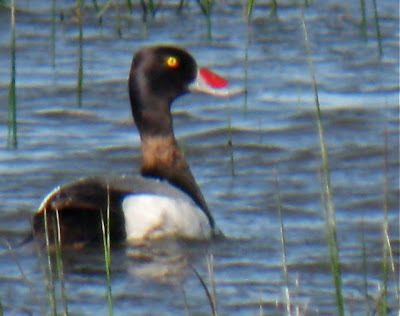 A clear side view of the mystery duck, showing the red-orange spot on the bill. 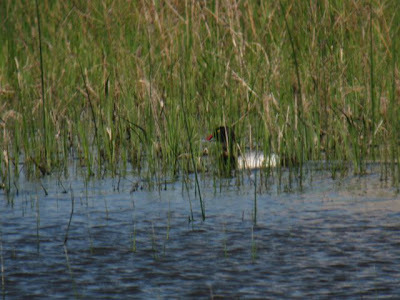 We watched the mystery red-billed duck for 20 minutes and during that time it became increasingly wary, it seemed—moving to the far end of the small lake and swimming into the thin vegetation there, as if to hide. We noticed that a female lesser scaup was with this apparently male bird, but we had no explanation for the weird color on his bill. This female was hanging close to the odd-looking male. The pair on the lake, swimming away from us and the other scaup present. Through my spotting scope, despite the wind and distance, we could see that the red-orange on the bill did not appear to be blood from an injury. The color was wrong. When you are in the field (and far from your reference library of field guides) looking at an odd bird, it can be difficult to remain calm and rational. Your heart starts pounding, your eyes get big, and your brain, which has been running on 1/3 power for most of the day, suddenly finds the energy and enough working synapses to leap to some spectacular (and usually wrong) conclusions. Surely this is something fantastic—a first North American record! Or at least a first for the continental U.S. You'd even settle for a first state record for North Dakota...it's GOT to be at least that good. 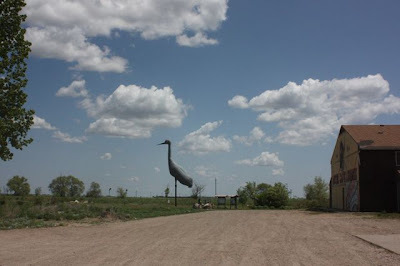 Soon the bird was too far away for reliable views, so we headed down highway 36, headed west into the coteau. But we kept debating our ideas and impressions about this bird. We felt reasonably sure that this bird was a scaup or a scaup relative. I had a feeling this was a regular lesser scaup with some sort of physical anomaly or, perhaps, some sort of bill marker placed there by a researcher. Julie was not giving up on the fact that this could be either an escaped bird from an exotic waterfowl facility or zoo, or a true vagrant that ended up far from its normal range. Secretly, I wanted her to be right because it would be so much cooler if the bird turned out to be something from far away. A few things bothered us about my assumption that this was just an odd scaup. 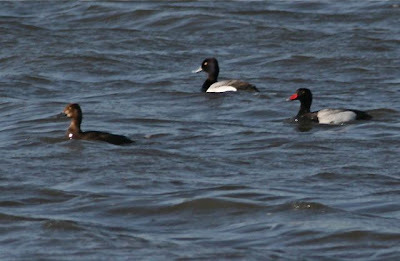 First of all the bird looked duller in color than the other male lesser scaup around it. Secondly, its head shape was flatter and less pointed than other males we could see. 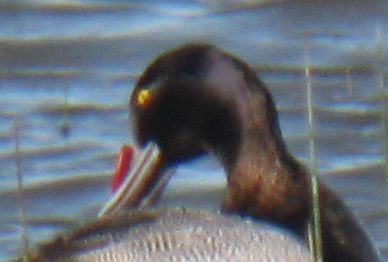 This made the head/bill shape look more canvasback-like than scaup-like. Thirdly, it behaved weirdly (swimming with its body and head low to the water, as if in a submissive pose) when several other male scaup approached it and what we assumed was its/his mate. It was all too much to let go unresolved. We made a point to return to the same pond on our way back to Jamestown after our route-scouting trip was done. Five hours later, about 4 pm, we pulled over alongside the road to scan the pond that, earlier in the day, had held the weird duck. 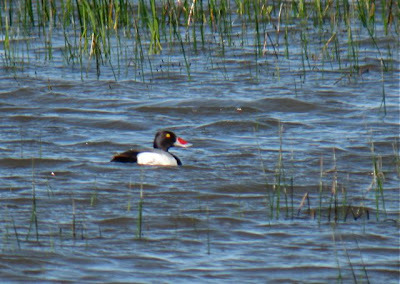 There were scaup there, but none with an orange-red bill. Where was it? Had we let the discovery of a lifetime slip away? 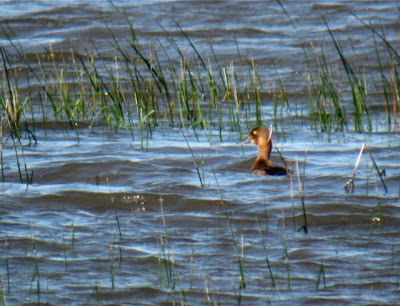 Had we let a species new to science (Thompson's scaup or maybe Zickefoose's pochard) flap away on the cool prairie wind? 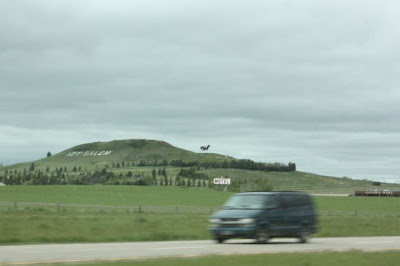 Along North Dakota's State Route 36, headed west from Pingree, ND, the slightly rolling landscape gently lifts itself onto the coteau, where glaciers dropped their heavy load of ice, rock, and sand millions of years ago. The landscape in every direction is dotted with water. This water is in ponds, lakes, prairie potholes, sloughs, wet meadows, streams, and roadside ditches. And in every place where water collects there are ducks. Some of these ducks are nesting, some are still courting. Some are resting and foraging, and some are just passing through. A bird watcher can scan his or her optics across a small prairie slough and see eight or more different duck species in the time it takes a western meadowlark to sing a single phrase. Gadwall, wigeon (American), teal (blue and green), scaup (lessers), ring-necks, redheads, canvasbacks, mallards, shovelers, pintails, ruddies, hoodies, all are there... The possibilities make it worth checking out any chunk of water you encounter. As I scanned with my binocs, checking off the familiar forms of the species we expected to see, I came upon a bird I did not recognize. Mystery bird on the right. "Holy CARP!" I said—or something to that effect! "What is THIS? It's got an bright orange bill!" Julie got on it and we began to speculate (read: taking wild guesses at what this bird was). 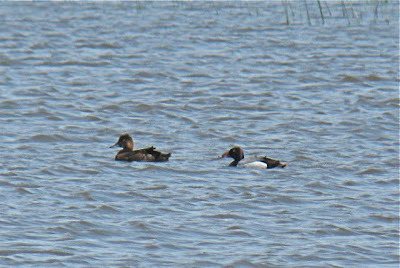 Mystery bird on the right, clearly showing a red-orange bill. We spent the next hour studying the bird, taking regular digital and digiscoped digital photos and video. What WAS this creature? At least one of us was sure it was some rare Asian stray, blown off course by the season's final Alberta Clipper and deposited in our laps for this, our seventh P&PBF in North Dakota. Is this a he or a she? 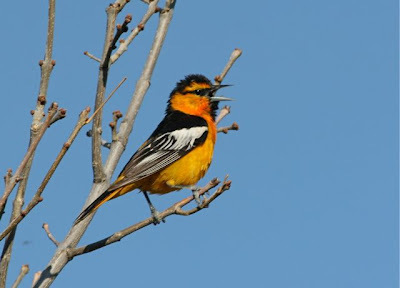 For many bird species, females get the short end of the stick when it comes to bright plumage, singing ability, and, in some cases, offspring rearing duties. Think for a moment about the life of a male ruby-throated hummingbird: He sets up a territory, courts a female (or several), fertilizes as many eggs as he can, then his job is done. He goes and hangs around the feeder, spending the day drinking and fighting, like an unemployed bully. The female whose eggs he fertilized? He can't even remember what she looked like. No so with the phalaropes. Or, exactly so with phalaropes, but with the sexes reversed. Consider, if you will, the Wilson's phalarope. 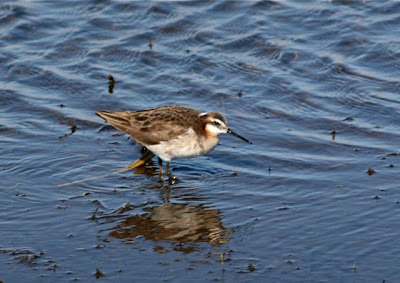 We get to see Wilson's phalaropes each June when we're in North Dakota. This year's wet spring in the Dakotas seemed to provide more nesting and foraging habitat for the phals, so they were almost everywhere. 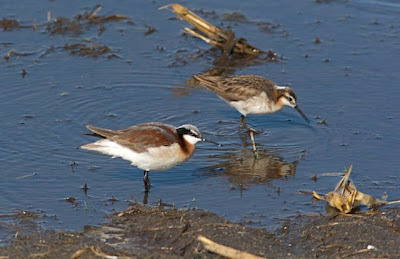 While out doing some casual bird watching with my OWN offspring, Phoebe and Liam, we happened upon the pair of Wilson's phalaropes depicted in my photos, in a flooded cornfield. After both kids got a good look at the pair, I asked them which one they thought was the male. Both kids chose the more brightly colored of the two, until Phoebe deduced that this was probably a trick question. In phalaropes, the sexual dimorphism is flipped from what we see in most other birds. It is the female that is both larger and more colorful in appearance. Males are duller colored to blend in better when incubating eggs on the nest. But as that annoying huckster Billy Mays often says "But wait! There's MORE!" 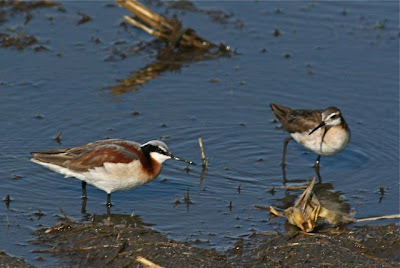 Female (left) and male(right) Wilson's phalaropes. Meanwhile, back at the nest, Mr. Phal get to incubate the eggs and, once the precocial chicks emerge, he and some of his fellow single dads get the kids together to learn the intricacies of life as a phalarope. Now I am sure that some of my fellow humans out there think this just ain't right. That this particular gender roll reversal is not only evil, it threatens the very fabric of our society, if not our freedom. I just think it's one of the million of cool things that we as bird watchers are privileged to know, once we take the time to learn them. This photo shows the size difference between the sexes. She is bigger than he. By the way, when you were a beginning birder, did you know how to pronounce PHAL-a-rope? I've heard all kinds of versions: fall-AIR-oh-pee, fal-ar-ROPE-ee, PHIL-an-thrope, Sha-SHEV-skee. 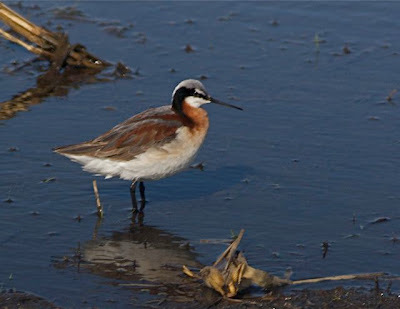 For an excellent (but not overly scientific) explanation of the breeding cycle and natural history of the Wilson's phalarope, read Dave Iron's post about this subject on BirdFellow.com. 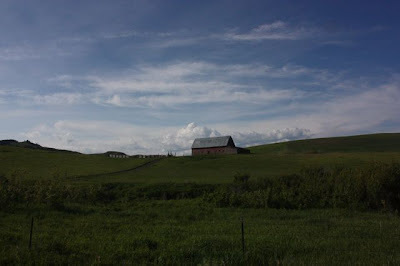 Morning sun on barn and meadows near Belt, MT. We've recently returned from a week apiece in North Dakota and Montana. 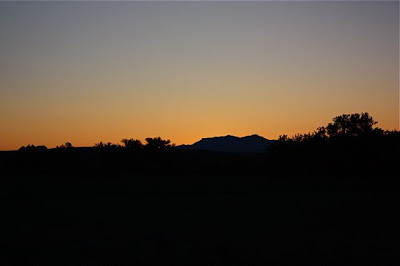 In addition to adjusting to the different landscape, different birds, and earlier time zones (Central and Mountain Time) of the western Great Plains, I've found notable differences in the light. It's more buttery or lemony early and late in the day, but also brighter during the mid-day hours. American white pelicans that at dawn look pinkish or creamy yellowish-white, are blindingly white at noon. One other major difference is the length of the day at these more northerly latitudes. It starts getting light shortly after 4:30 am and you can still read a book or ID a bird through your binocs at 10:15 pm! I found this especially noticeable during the two nights we were camping along the Missouri River. The poor-wills were still calling when the western kingbirds and western meadowlarks began their morning vocal crescendi. End of the day Slaughter River, MT. Not that I minded that. It is fear that motivates me to get up early when on vacation: fear that I will miss out on something cool or amazing or beautiful. And I want to squeeze every last drop of juice out of the plum that is my "vacation" (even when it is a mostly working vacation trip as this one was). So I always stay up late and get up early, camping or not, when traveling. Pheasant under grass, early morning near Pingree, ND. Here are a few of the scenic views that caught my eye and camera during the first two weeks of June when I was way out west. 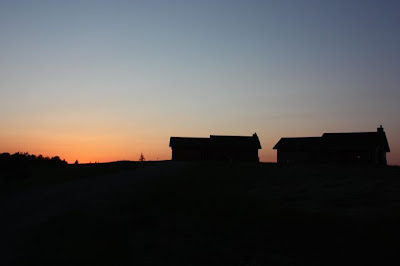 Sunset behind our cabin at Lakeview Meadow Resort, near Jamestown, ND. 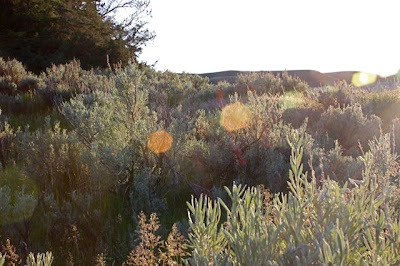 Sun sparkles over sage, Little Sandy Creek, MT. 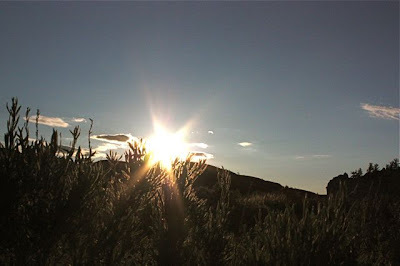 More sun sparkles over sage, Little Sandy Creek, MT. 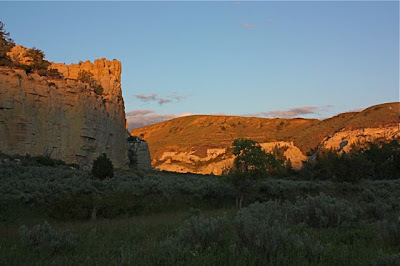 Dusk settling in at Stonewall Canyon along the Missouri River. How many sunsets have these stone walls seen? 1. I felt a pang of hunger. 2. I really wanted to roll up to the drive through and mumble, in my best Sling Blade voice: Gimme a sack o' them biskit holes and swipe on sum o' that yeller musterd, please. 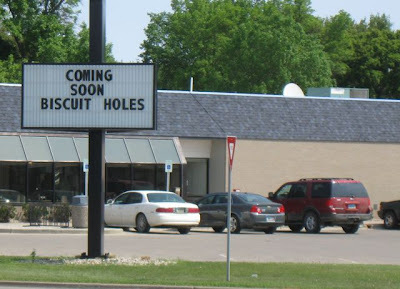 And gimme sum o' them french fried pataters, too...Hmmmmm. One of the lifer sightings for me during the Montana portion of our trip west, was the sight of cliff swallows nesting on actual cliffs. Where I'm from the cliff swallows nest on buildings, bridges, culverts, and dams, but I'd never seen them nesting on the natural features for which they are named. 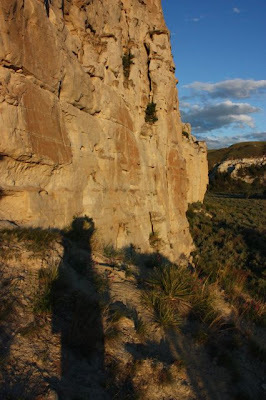 These shots were taken in and around Virgelle, Montana, where we embarked upon our three-day canoe down the Missouri River. 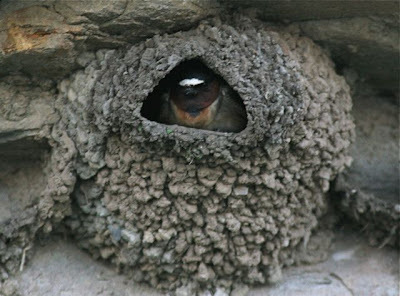 The truly amazing thing about cliff swallows is that they build their nests one bill-full of mud at a time. It can take them up to two weeks to build the nest—depending upon how far it is to a reliable source of mud. A pair will bring more than 1,000 small batches of mud to the nest site during construction of the nest. 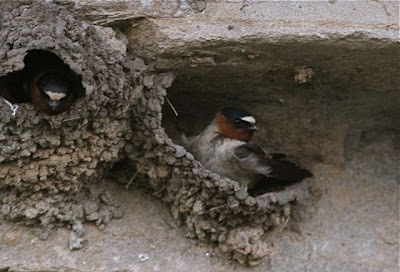 Cliff swallows are colonial nesters, preferring to nest with other cliff swallows. The colony near Virgelle had a mud source just a few hundred feet away. 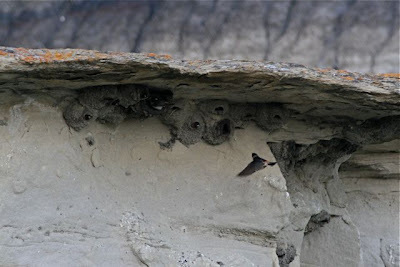 The finished nests are jug-shaped and provide a perfect spot for raising up a brood of baby cliff swallows. Some of the colonies we found along the Missouri had as many as 200 nests. Larger colonies of as many as 2,000 nests can be found. 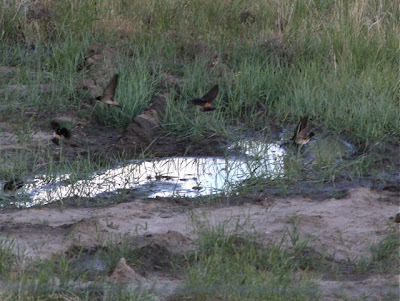 As we floated past these birds along the river, I wondered what Lewis and Clark thought about them, when they saw the first cliff swallows chattering along the muddy banks,cutting through the blue skies, and swooping up to their odd-looking nesting colonies. It must have been a remarkable thing to see. 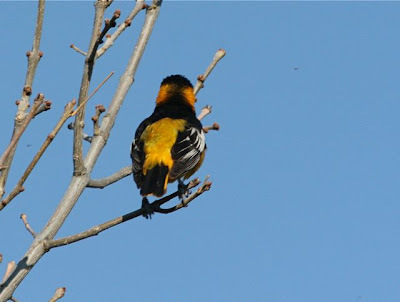 Three views of a cooperative Bullock's oriole taken during the bird walk I helped to lead this morning at Giant Springs Park in Great Falls, Montana. We're at the 35th annual Mountain Bluebird Trails convention, but it's not ALL about bluebirds. 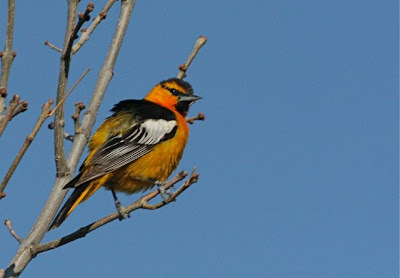 We also look at birds of other colors, like orange. I'll be writing more about this trip soon, after we get back home and our brains and bodies settle down to normal. 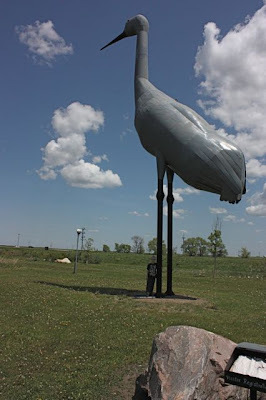 When you are driving west on I-94 through the heart of North Dakota, it's hard to miss the World's Largest Sandhill Crane which lives in Steele, ND. 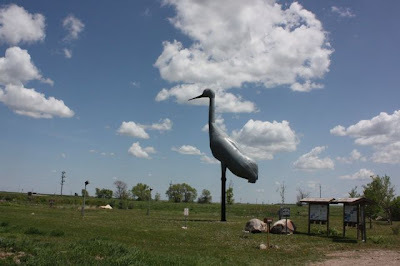 I've been leading trips, giving talks, and digging the scene at The Potholes and Prairie Birding Festival in ND for the past six years and every June during the festival, I try to make the pilgrimage to this holy birding shrine. You must approach Sandy with a mixture of caution and reverence. It's a bit of a risk because he's perfectly bite-sized for a giant sandhill crane, but we let Liam pose beside Sandy's massive legs. It's good to see you doing so well, Sandy. Until we meet again...keep your feet in the mud and your head in the clouds! Well kids, it was mighty tough to pick a winner for Caption Contest #7. We had a lot of funny entries and every single one was good. But here, finally, is the one the judges chose. The directions where supposed to say to watch for the sign. The misprint cost Chuck hours. Congratulations to rmharvey, who is the lucky winner of a $25 gift certificate to the Bird Watcher's Digest online store. RM, please contact me directly (editor AT birdwatchersdigest DOT com) to set up the transfer of funds into your Swiss bank account. Birding with Buster was such a drag. At every arrow he'd stop and try to find what bird it was pointing at. Bill getting a close up of a sharp "tern"
Although quite common along roadways, a close view of the brightly colored Turnus vulgaris is always a treat. Thanks to everyone who came out to play for Caption Contest #7. 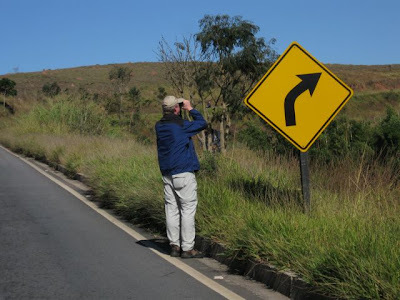 And a special thanks to my friend Chuck Hagner at Birder's World Magazine for letting me use this image of him which I took (sneakily) on a birding trip to Brazil. I didn't even ask his permission to use it and Chuck (always a good sport) did not call in the lawyers (at least not yet). Thanks, CH! Apologies for the delayed results post. It seems I have discovered one of the last Internet-free zones on the planet. And I only just now found my way out. However I may be entering another Webless realm over the next few days, so if there's nothing new here, you'll know that the weather was nice enough for us to float the Missouri River. If there are new posts here it's either because the weather was horrible or I have perfected cloning (or figured out the ant's technique for storing up blog posts and scheduling them in advance). OK. None of that makes any sense.